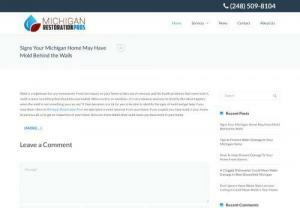 Michigan Restoration Pros is the #1 choice for cleanup and restoration in Michigan. We cover many areas in Michigan. Our professionals deal with everything from smoke and fire damage to water damage. We also offer professional carpet cleaning to all of our customers. You might not think you need carpet cleaning services, but if you are running a business, it's important to keep the building up and carpet cleaning is one of the ways to do just that. Contact us today and let's get started!